Drums in the Deep: A Ninth Planet? From the first moment humans looked at the sky, their eyes — with or without aids — could see five wanderers against the celestial backdrop: Mercury, fleetingly visible outside the Sun’s glare; Venus, so bright it can cast a shadow (Eosphóros at dawn, Phósphoros at dusk); Mars, its brick-reddish hue apparent even at aphelion; Jupiter, second to Venus in brightness; and Saturn, about as dim as Mercury – though someone with exceptional vision might just discern the slightly elongated shape that would later prove to be its rings. And there the count of the solar family remained until the late 18th century, when telescopes and the mathematics of trajectories got sophisticated enough to enable astronomers to make and test predictions. At that point, the Herschel siblings established that Uranus was not a star but the planet next out from Saturn. A little less than a century later, Le Verrier noticed the “tugs” at Uranus’ orbit. Based on these, he predicted, then visually found, Neptune. But Neptune’s orbit showed irregularities also, plus its mass did not totally account for the Uranian perturbations either. 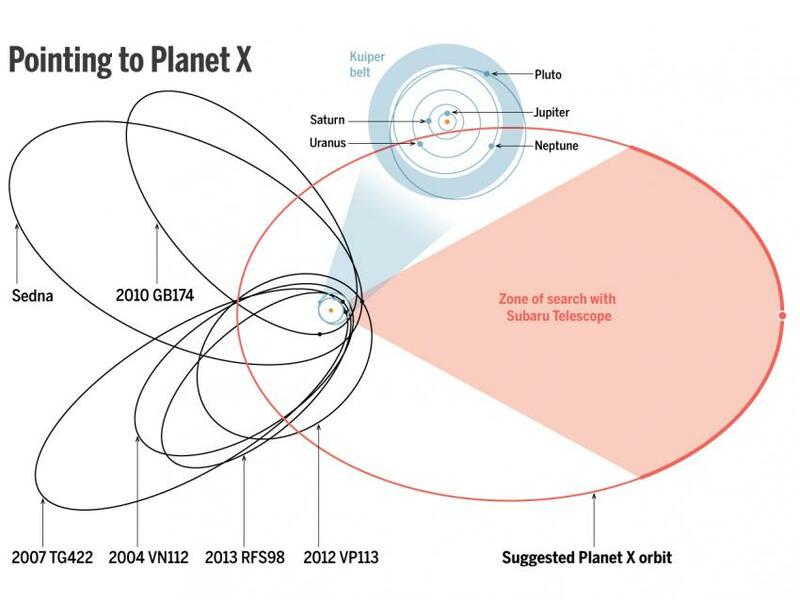 So the search started for Planet X (pedantically speaking it should have been IX, but X is the standard denotation for an unknown). And that’s when things stopped being simple. The next iteration of the methods that had added Uranus and Nepture to the solar herd yielded Pluto. 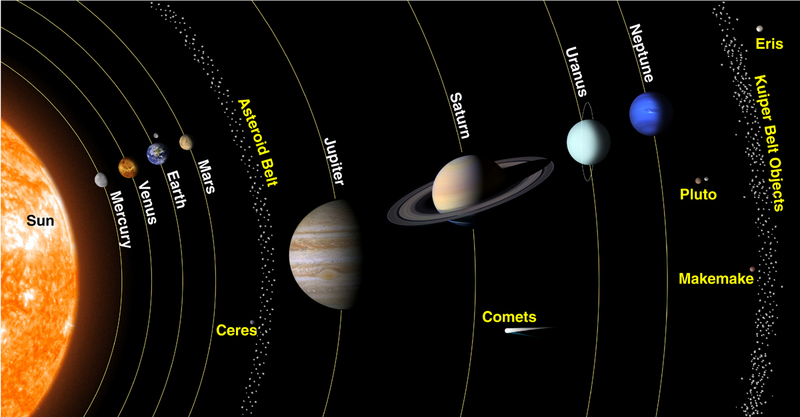 The problem with Pluto, which led to its eventual dethronement as a planet, is that there are many Pluto-sized planetesimals in the asteroid and Kuiper belts and in the Oort cloud — several with accompanying moons, like Pluto has Charon. Amusingly, many carry names of female gods or heroes and/or from mythologies beyond the Roman in a belated effort to change the heavily skewed naming ratio of the major planets. So either Pluto of tiny mass and eccentric orbit did not deserve the distinction of being called a planet – or Vesta, Ceres, Eris, Sedna et al had to be included in the roster (side note for SFF doofs like me: Eris, named after the goddess of discord, was originally called Xena; its attendant moon is officially called Dysnomia, the Greek term for Lawless… as in Lucy Lawless, who played Xena the Warrior Princess; personally, I think they should have stuck with Xena and Gabrielle, but I’ll admit to some lack of objectivity). To the relief of both astronomers and astrologers, scientists drew the line at entities so small that, even if they’ve attained roundness, don’t have the oomph to either fling or pull planetesimals in their vicinity. Yet the idea of a giant planet or brown dwarf hiding in the outer darkness has too strong a hold on our imagination. Starting with paleontologists Raup and Sepkoski, scientists proposed such a distant lurker whose orbital movement might have caused impact events resulting in the mass extinctions that occur on Earth about every 27 million years. For obvious reasons, they called this hypothetical planet Nemesis (Retribution). The long, systematic hunts for Nemesis yielded nothing except the conclusion that nothing larger than Saturn is rolling for several thousand AUs beyond Neptune. That’s disappointing, but there’s a large size gap between Saturn and Pluto where a respectably sized outcast can still dwell. The productive game of checking for orbit irregularities and sweeping/herding behavior got applied again recently, when several astronomers (first Sheppard and Trujillo, then Batygin and Brown – all Kuiper aficionados and decisive influences in demoting Pluto) noticed a pattern in six “sednoids” – largish denizens of the Kuiper belt. Their behavior indicated that they had been disturbed by something large. So Brown and his collaborators fed the pertinent details to a simulator… and out popped the prediction of a planet at least 10 times as massive as Earth (i. e. Neptune-sized) with a highly eccentric, off-center orbit – a victim and survivor of ejection from the inner regions of the solar system during the early stages of its formation. Brown was meticulous in exploring and evaluating all other possible explanations of the planetesimal disturbance pattern, just as Boyajian and her co-authors did with the anomalous brightness dips of KIC 8462852. The hypothesis of a Neptune-sized planet at that region passes the Occam’s razor criterion. But only one thing will make Planet Nine move from hypothetical to real: seeing it with a telescope. So some astronomers have been sweeping the starry dark with high-powered wide-field telescopes, while others have been comparing time-lapse photos to see if a bright needle has moved relative to the rest of the haystack. If Planet Nine proves to be real, it will give us important insights into the workings of our solar system and will help us judge how unusual it is compared to other systems found by the industrious Kepler telescope. And if its existence is confirmed, the arguments about its specific details will pale in comparison with those over what to name it. Some want it called Jehosaphat; others, Janus. But I propose Tiamat, the exiled Great Goddess of the Deep. Trujillo, Chadwick A.; Sheppard, Scott S. (2014). A Sedna-like body with a perihelion of 80 astronomical units. Nature 507: 471. Batygin, Konstantin; Brown, Michael E. (2016). Evidence for a distant giant planet in the Solar system. The Astronomical Journal 151: 22. You are currently browsing the Astrogator's Logs weblog archives for February, 2016.